I am trying out MarkdownPad (2.2.1) and have set the background colour to blue and the font colour to white in the editor window (Options/ Editor/Text Appearance). When I enter a heading eg "# Heading 1 # it appears in red. Is it possible to change the colour to another colour (and/or appear emphasise/bold). I cannot see an option on how to do so. This is not currently possible, but I'm glad to say the ability to change all "Markdown syntax highlighting" colors will be included in an upcoming update. (Not today's update, but the one after.) The feature is nearly finished and just needs some final work before its ready for use. Have registered for MarkdownPad Pro. I'm looking forward to this as well. 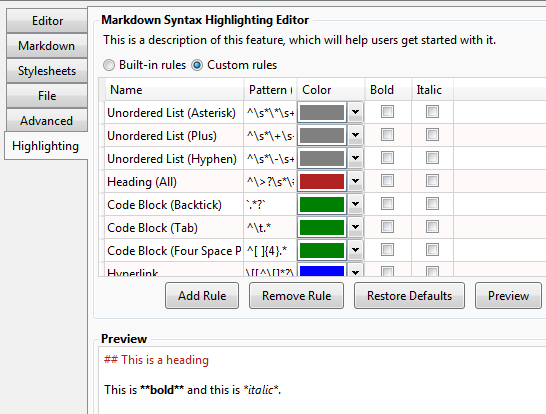 Thanks for your awesome MarkdownPad! Hi, This feature will be very useful and am eagerly looking forward to this. I notice this thread is from a while back, what is the expected date for this feature to be released.